b. 7 Dec 1924, Lawrence, Mass. son of Antonio DiZazzo and Anna Salvi. m. Florence E. Lightfoot (b. May 1929). m. Maryann Viscuco, b. 29 Aug 1952; d. 7 Jan 2007.
d. 19 Nov 2007, Andover, Mass. 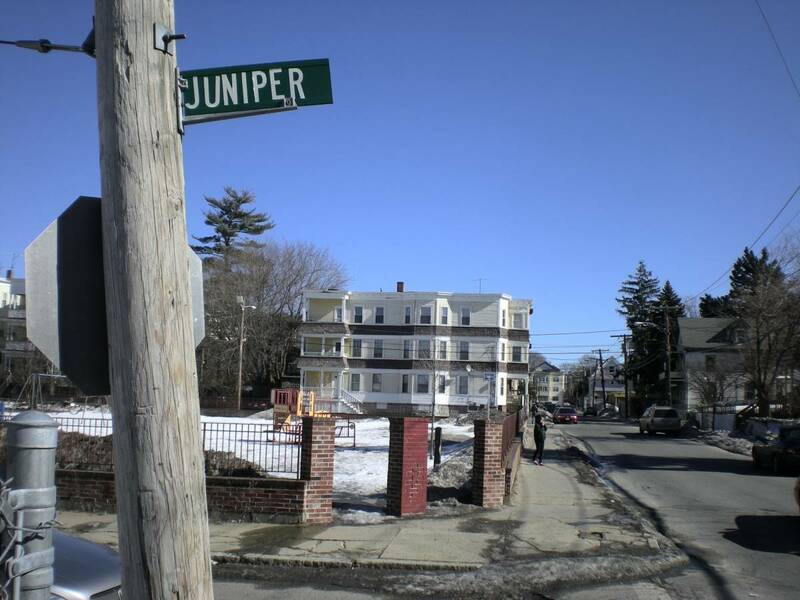 Elizabeth DiZazzo, 3 Lexington Avenue, Methuen, MA spoke about her grandfather Americo DiZazzo [late of 41 Juniper St.] and the intentions of City Council to dedicate a square in his name. 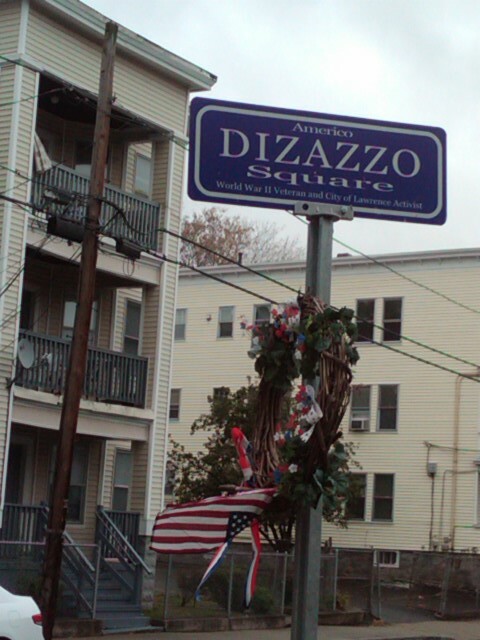 At the request of Council President Blanchette,Councilor Kolofoles presented the report from the Ordinance Committee in the form of a motion to award the dedication square at Juniper Street and Basswood Street in honor of Americo DiZazzo [late of 41 Juniper St.] Councilor Kolofoles commented upon the dedicated service Mr.DiZazzo provided to the United States and his continuous interest and participation in Lawrence Municipal government and politics. The motion was seconded by Councilor Moran. Upon being granted the floor, Councilor Abdoo commented on the multiple bronze stars awarded to Mr.DiZazzo during his service in the military. Council President Blanchette discussed his prior politica relationship with Mr. DiZazzo and recounted events and experiences through their political careers. Upon no further comment or discussion offered by the Council Members present, Council President Blanchette called upon the Council Members to consider the matter presented. 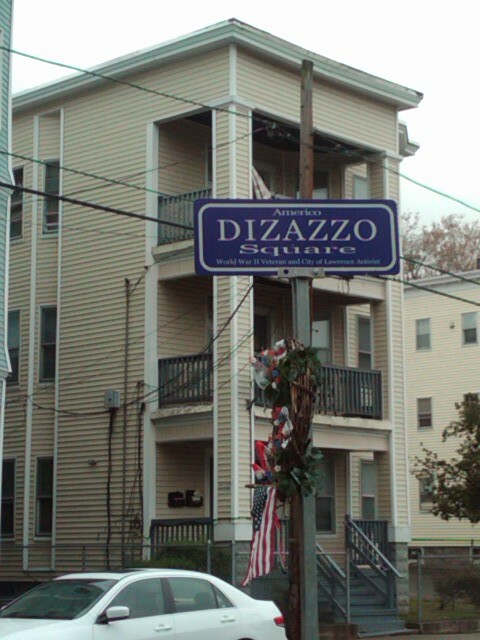 Upon a motion to approve the measure as presented by Councilor Kolofoles, and seconded by Councilor Moran, the Council Members present voted unanimously [7-0] to dedicate a square in honor of Mr. DiZazzo to be located at Juniper Street and Basswood Street. DiZazzo Square on September 2, 2009 (click on images to enlarge). METHUEN - Americo "Rick" DiZazzo, 82, of Methuen, died Monday, Nov. 19, 2007 at Academy Manor Nursing Home in Andover. He was born on Dec. 7, 1924, in Lawrence to Antonio and Anna (Salvi) DiZazzo. He attended Holy Rosary Church in Lawrence. Rick attended local schools and churches. He served in the U.S. Army in World War II during the European invasion. Part of his medical training took place at the Walter Reed Hospital in Washington. Upon his return, he attended the MacIntosh School of business and worked in various factories in Lawrence and Lowell. He retired from the Ludington Footwear, Lawrence in 1984. His interests included his large family of children, grandchildren and great-grandchildren, also siblings and relatives. For many years Rick called the WCCM radio talk show, keeping track of political affairs and politicians to monitor their responsibilities, good or bad and formed a great fan base. Rick was a regular at the city council meetings. 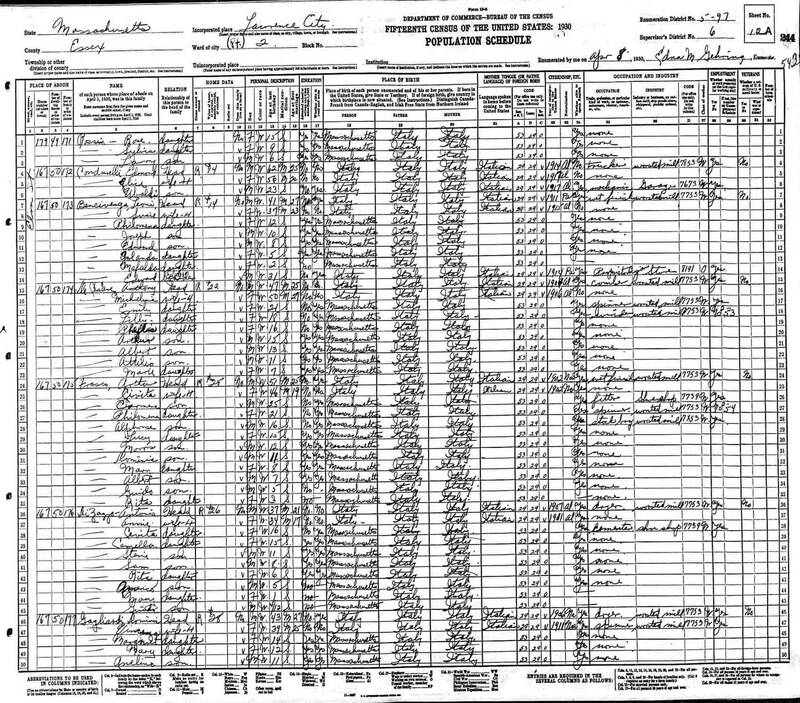 Mr. DiZazzo is survived by his wife, Florence (Lightfoot) DiZazzo of Methuen; two daughters, Susan Woodman of Methuen, Anne and her husband Forest Sullivan of Lawrence; four sons, Thomas DiZazzo of Florida, David DiZazzo of Lawrence, Anthony DiZazzo and his wife Yolanda of Methuen, and Steven DiZazzo and his wife Zofia of Methuen; two brothers, Guido aka "DoDo" DiZazzo of Florida, Rudy DiZazzo of Lawrence; one sister, Rita Lacourte of Lawrence; 13 grandchildren; and three great-grandchildren; and several nieces and nephews; former son-in-law, Keith Woodman of Salisbury. He was also the father in law of the late Mary Ann DiZazzo. ARRANGEMENTS: Family and friends may call on Friday, Nov. 23, 2007 from 5 to 7 p.m. at the Cataudella Funeral Home, 126 Pleasant Valley St., Methuen, MA 01844. Funeral services will begin at the funeral home on Saturday, Nov. 24, 2007, at 9:15 a.m. with a Mass of Christian burial at 10:30 a.m. at Corpus Christi Parish at Holy Rosary Church, 35 Essex St., Lawrence, MA 01841. Burial will follow at a later date. In lieu of flowers donations may be made to the Lazarus House, P.O. Box 408, Lawrence, MA 01842. Americ DiZazzo was enlisted in the U.S. Army May 6, 1943, at Boston, Mass. This record last updated 25 November 2009 by D. Trumbull.